Board votes to require examination of "all sides of scientific evidence"
(CNN) -- Dueling theories of how the universe was created got a split decision Friday night from the Texas Board of Education, which required examination of "all sides of scientific evidence" in new science standards, but rejected language requiring teachers to teach the "strengths and weaknesses" of scientific theories. The debate pitted proponents of Charles Darwin's theory of evolution against supporters of religion-based theories of intelligent design, or creationism. "Science loses. Texas loses, and the kids lose because of this," board chairman Don McLeroy, a creationist, told the Dallas Morning News. "In all fields of science, analyze, evaluate, and critique scientific explanations by using empirical evidence, logical reasoning, and experimental observation and testing, including examining all sides of scientific evidence of those explanations so as to encourage critical thinking by the students." Earlier, the board rejected two sections written by McLeroy on identical 8-7 votes, the Dallas Morning News said. One section required teachers to "analyze, review, and critique scientific explanations, including hypotheses and theories, as to their strengths and weaknesses using scientific evidence and information," and the other required high school students to study the "sufficiency or insufficiency" of key principles of evolution. Opponents were pleased with the board's action on McLeroy's sections, but unsatisfied with the final result. "The phrase has been an open door to religious indoctrination in public schools," Mark Finkelstein, a lawyer with the Anti-Defamation League, told KPRC, referring to the "strengths and weaknesses" phrase in the material voted down. "This document still has plenty of potential footholds for creationist attacks on evolution to make their way into Texas classrooms," Kathy Miller, president of the Texas Freedom Network, told the Dallas Morning News. She predicted battles over textbooks in the coming years, a prediction McLeroy bolstered. Publishers, he said, will "have to get their textbooks approved by us in a few years." The size of the textbook market in Texas gives it influence nationwide, as publishers adapt their material to its standards. Darwin's theory of evolution proposes that humans evolved over millions of years from animal species -- including, most famously, early primates that also are the ancestors of modern-day apes. Such thinking, which challenged religious accounts of a deity creating humans, was considered radical, even blasphemous, when Darwin published it in 1859. 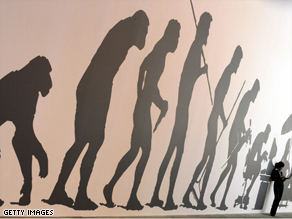 For decades, the teaching of evolution in public schools has been a flash point in some states, with proponents of ideas such as creationism and intelligent design trying to gain a place in science classes. The issue has been before school officials, legislators and courts in Alabama, Kansas, Kentucky, Ohio, Florida, Georgia, Louisiana and Virginia.